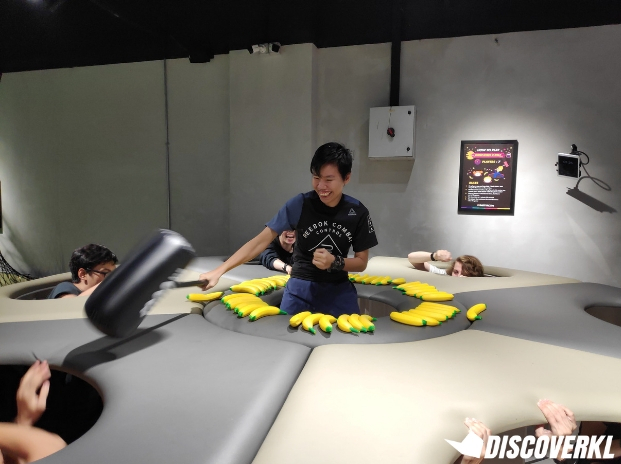 KL's First Interactive Party Room Lets You Play Human Whack-A-Mole, Jenga & More! 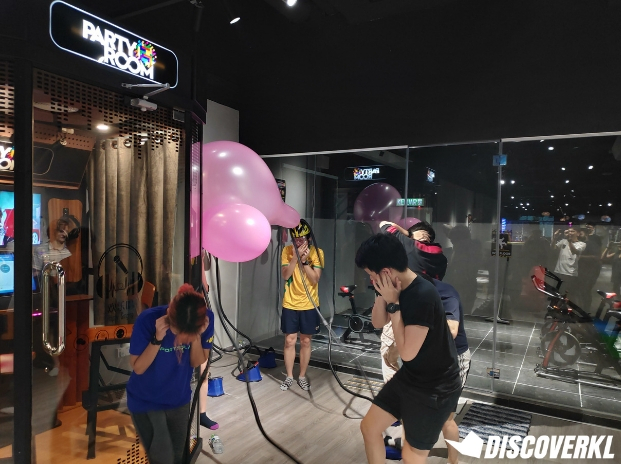 Recently, we were invited to visit the Party Room in Atria Shopping Gallery, PJ. 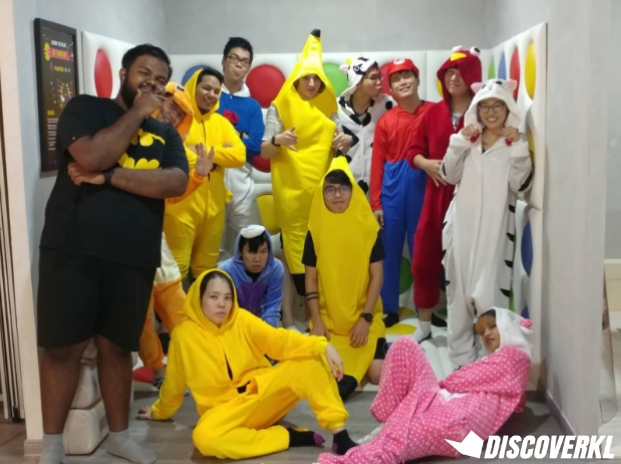 When we were invited, the first thing that came to our minds was clubbing or drinking booze as that’s what young adults typically do for ‘partying’. 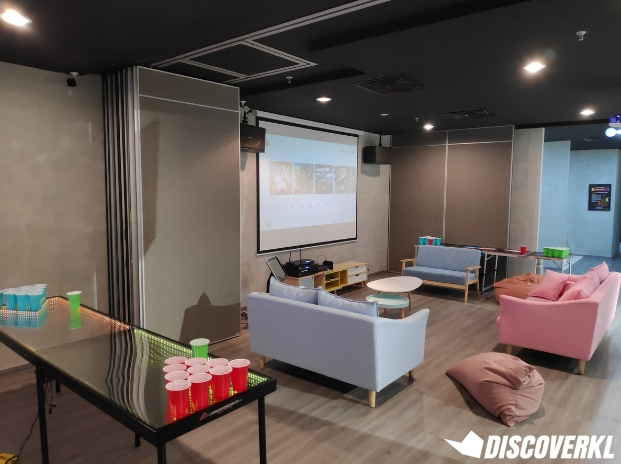 However, we were so wrong when we stepped into the Party Room as it was actually a party space for young adults to have fun, basically a playground for adults. 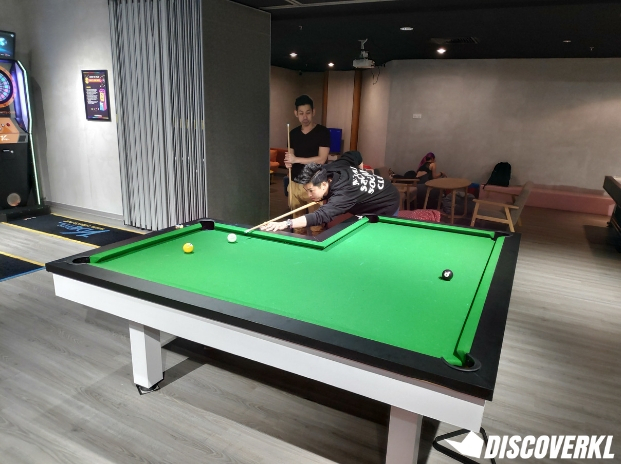 With so many different activities such as Rainy Bike, Floor Curling, Human Whack-A-Mole, an L-shaped pool table, 3D Twister and many more, there’s something for everyone! The first game we played was Human Whack-A-Mole where one player stood in the middle and was in charge of hitting everyone else who was stealing the bananas which are positioned in the middle. The aim of the game was to retrieve the most bananas out of the lot. If you think getting hit by the hammer won’t hurt, think again as the hammer is pretty sturdy. In fact, one of our colleagues hit it so hard until the the top came off! (I’m looking at you, Keith). 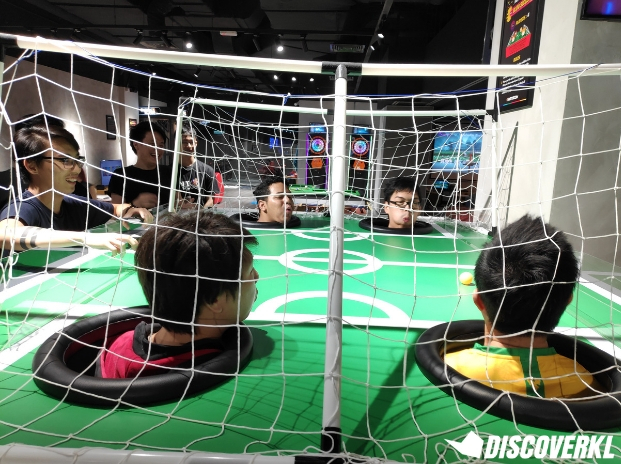 The second game we experienced was Blow Soccer where 2 players from different teams have to sit on a chair and pop their heads out on a ‘football pitch’. 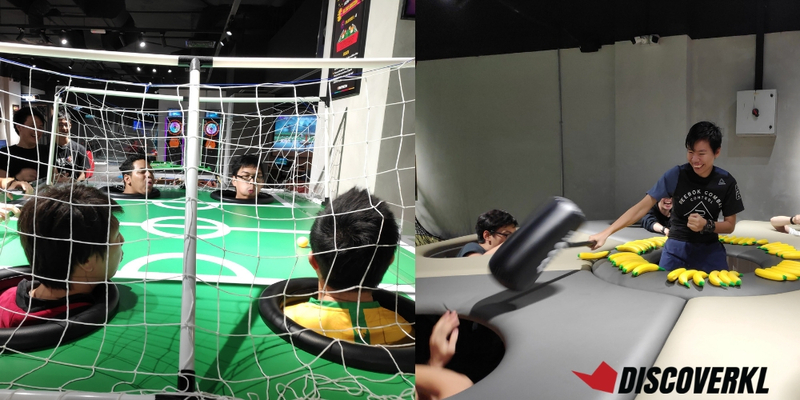 Players will then have to blow a ping pong ball to the opponents’ goal and the best ‘blower’ wins. Tip: The best strategy that I found for this game was to conserve all of your breath by inhaling and holding it in. Then, wait for the ball to come closer to you and let all your breath out at a go. Do note that taller and bulkier people might have a problem fitting under the table and as I’m on the taller side, I found it very uncomfortable. 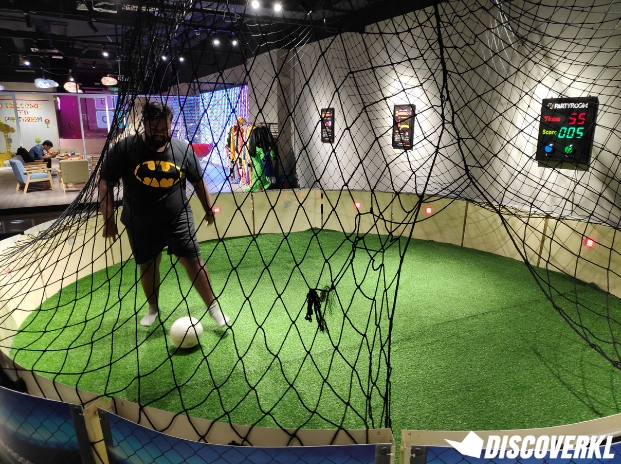 Moving on to the next game, it has to actually be something you’re good at—kicking balls. Basically, the goal of the game is to hit the boards surrounding the field. The boards will light up in different colours and one player will be kicking the ball at it. Different colours hold different points: 2 points for green, 1 point for yellow and -1 for red. Out of all the games, I find that this is the one where skill really comes into play as you have to know how to aim and kick the ball and be quick on your feet as the player with the most score in a certain time limit wins. The highest score among the teams was over 70 points and it was pretty amazing. So, it’s best to have someone who knows how to play football on your team. 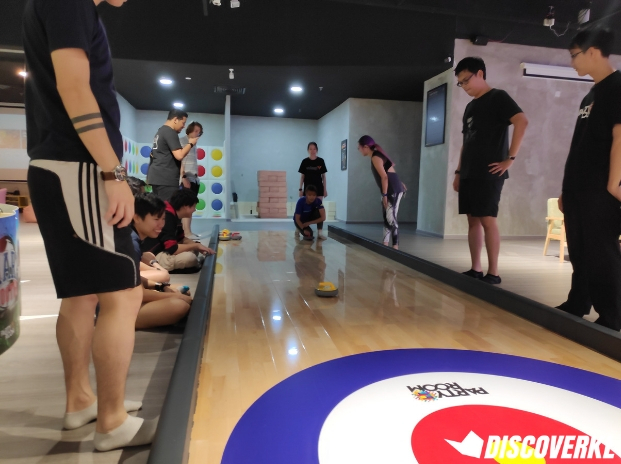 After that, we tried Floor Curling. It’s similar to the Olympic sport of curling but this time there’s no ice involved. So, you won’t need your teammates to be at the other end sweeping furiously to make your stones move further. One team gets a total of 4 stones and whichever team’s stone is closest to the innermost circle (the yellow circle here), wins. The best strategy is to start second as you will have the last curl and the advantage will be yours. It also depends whether you are able to gauge your strength as the stone has wheels on the bottom. If you put in too much strength, it might go too far (like how one of our colleagues did). However, at the end it really all comes down to luck rather than skill as we’re not professionals. Next up, the 2 lowest teams were in for a round of punishment. They had to do a so-called punishment game where there clearly is no winner. The loser has to stand near a freaking huge balloon that is going to pop at anytime! Basically, one person has a balloon on their head and the other 2 has to pump the balloon by stepping on a pedal, so yeah no real winners as you would have to deal with the anxiety of a balloon popping at any second. After almost 2 hours of laughter, it was time for the final game and even though we were already exhausted, this game involved physical effort—cycling! Honestly, I was looking forward to this one as it appeared to be the most fun. That’s because, the losing team that pedals the slowest will end up getting wet! Don’t worry about your clothes getting wet as raincoats are provided. Trust me, you had better save up all of your energy for this one as it took forever for it to end. It probably took a rough estimate of 5 minutes of intensive cycling from both teams until the water came pouring down on the losing team. Although our team won, we still wanted to experience getting splashed on as we were already sweating buckets, so yes we got to experience getting wet too! Do be careful though as if you pedal too quickly, you might lose your grip on the pedal and it might hurt you (I wound up getting a blue black from it). After all of the pedalling, all of us were knackered and were ready to head home. Although we were tired as heck, we had a great time too. As our competitive spirits burned, so did our thighs at the end of the day. Most of us had sore thighs or bums for a few days as we aren’t the fittest bunch. But it was all worth it in the end.